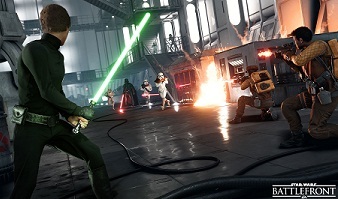 Training: This mini-mission primarily serves you to learn the game mechanics of Battlefront. But don't worry you are not gonna get bored, because you are rushing as a scout trooper with speeder bike through the forests of Endor or air battle with X-Wings and TIE fighters. In addition, you assume the role of Darth Vader and Emperor Palpatine. Battle: In the 1-vs-1 mode, on different planets, you play against a friend or alternatively you play this mode alone against AI units. Here a player takes on the role of the rebels while the other represents the Empire. You can even optionally take AI allies. The aim is to collect loot through firings. The first team or player reach 100 points win the match. Survival: Together with a friend or optionally alone, you compete against different AI opponents. But that's not all! You can set up a so-called "Party" and enter with some friends together in the multiplayer mode. Especially, in the coordinated attacks in the game mode Walker Assault. However, in this mode, there's no split-screen option.